Found in FNA Volume 19. Treatment on page 173. Stems with slender branches. Leaf blades oblanceolate, 10–25 cm, margins dentate to lyrate-pinnatifid; cauline blades linear to lanceolate, margins dentate to pinnately dissected into linear-lanceolate segments. Heads long-pedunculate, ca. 5 cm diam. Involucres thinly hairy. Phyllaries green, rounded, outer scarious margined, inner with oblong, scarious appendages. Florets fragrant; outer conspicuously expanded, many lobed. Cypselae dark brown, 3.5–4 mm, glabrous; pappus scales 3.5–4 mm. 2n = 32 (from cultivated material). Phenology: Flowering winter–early summer (Jan–Jul). British Columbia is cited on the basis of a 1936 collection from ballast in Vancouver. Amberboa moschata has been reported from California, Illinois, Indiana, Iowa, Maine, and Utah; I have not seen specimens from those states. Amberboa moschata has been cultivated as a garden ornamental since the 1600s. It occasionally grows as a casual garden escape in the United States and southern Canada. 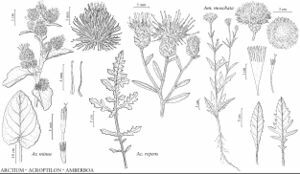 Wild forms of Amberboa moschata from Turkey and Armenia are described (E. Gabrielian and C. E. Jarvis 1996) as having pink or lilac marginal flowers, and a closely related species A. amberboi from central Asia as yellow-flowered. Corollas in garden forms are white, pink, purple, or yellow. This page was last edited on 22 April 2019, at 19:02.